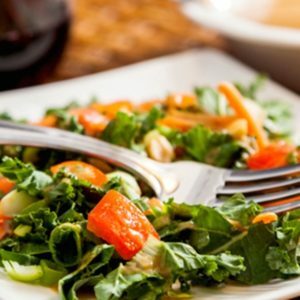 If you’ve never tried raw kale (or any kale), this is a great first recipe because the dressing is so flavorful. Kale is packed full of vitamin A and C and is low-carb. Your local grocery store or warehouse store might have the pre-package kale slaw, but you can substitute cabbage if desired. In a medium bowl, toss together the slaw, onions, bell pepper, and peanuts. In a small bowl, whisk together peanut butter, vinegar, water, oil, soy sauce, sugar, and garlic. Pour dressing over salad and mix to coat. Serve cold.